Hormel Foods Corporation (NYSE: HRL) invites you to participate in a conference call with Jeffrey M. Ettinger, chairman of the board, president and chief executive officer, and Jody H. Feragen, executive vice president and chief financial officer, to discuss the company’s third quarter results. The company will issue its earnings release before the markets open on Thursday, August 22, 2013, and will host a conference call at 8:00 a.m. CT (9:00 a.m. ET). WEBCAST: To listen to a live Webcast of the conference call, go to the company’s website, https://www.hormelfoods.com, and click on Investors, and you will find a link under the Webcast heading on the page. PHONE: Dial toll-free – 877-941-8609 at least 10 minutes prior to the call. From outside the United States, call 480-629-9692. Please note: all dial-in participants should quote the conference ID of 4632577 to access the call. AUDIO REPLAY: You can listen to a taped replay beginning at 10:30 a.m. CT on Thursday, August 22, 2013, until 11:59 p.m. CT on Thursday, September 5, 2013. 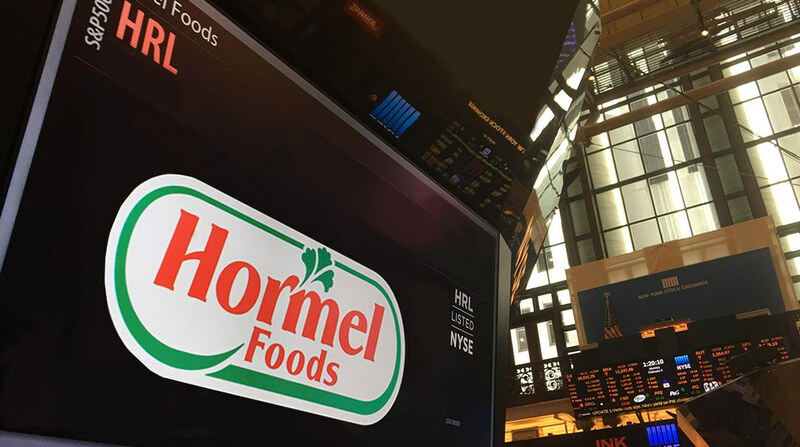 Hormel Foods Announces Webcast of Back-to-School Consumer Conference Hormel Foods invites interested investors to listen to its presentation at the Barclays Back-to-School Consumer Conference. Hormel Foods Announces Webcast of 2013 Investor Day Presentation Hormel Foods invites interested investors to listen to the company’s live webcast of the Hormel Foods 2013 Investor Day Conference. Hormel Foods Corporation, based in Austin, Minn., is a multinational manufacturer and marketer of consumer-branded food and meat products, many of which are among the best known and trusted in the food industry. The company leverages its extensive expertise, innovation and high competencies in pork and turkey processing and marketing to bring branded, value-added products to the global marketplace. The company is a member of the Standard & Poor’s (S&P) 500 Index, S&P Dividend Aristocrats for 2012, Maplecroft Climate Innovation Indexes, Global 1000 Sustainable Performance Leaders and was again named one of “The 100 Best Corporate Citizens” by Corporate Responsibility Magazine for the fifth year in a row. Hormel Foods debuted on the G.I. Jobs magazine list of America’s Top 100 Military Friendly Employers in 2012. The company enjoys a strong reputation among consumers, retail grocers, foodservice and industrial customers for products highly regarded for quality, taste, nutrition, convenience and value. For more information, visit https://www.hormelfoods.com.